Panoramic Views in the Heart of the City. Located near the airport in San José, the Hilton Garden Inn is ideal for business people needing a central location or for those wanting an easy-to-navigate jumping-off point in the city. This hotel is convenient to get to and only 20 minutes from the airport and 10 minutes to downtown. 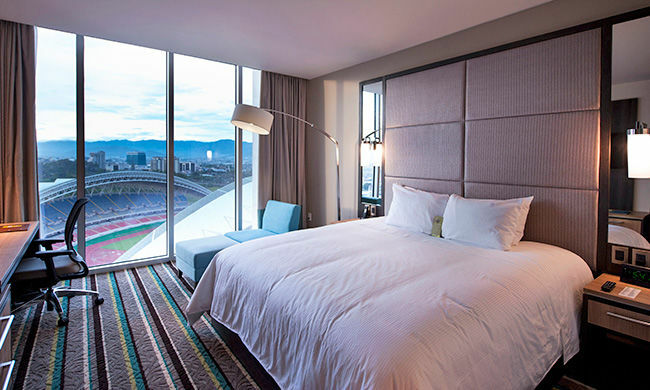 Enjoy impressive views of the Central Valley including the immense Sabana Park and the National Stadium. Rooms are spacious and comfortable, offering a sleek design with extras like a 40” LCD screen, a phone with voicemail feature, free phone calls, a mini-fridge, and an elegant work station. Modern installations are geared towards those here on business. In the business center you’ll find four meeting rooms for up to 150 people complete with audiovisual and sound equipment, WiFi and A/C. These rooms are open 24 hours and offer complimentary printing. Events can be coordinated. Other hotel amenities include the Garden Bar & Lounge, an on-site bar and international restaurant offering some of the best views of the city from its 13th floor location. Check out their happy hour with free gourmet appetizers. Room service is available from the restaurant between 5 and 10 pm. After hours, there is the Pavilion Pantry open 24/7 right next to the reception. There is also a gym and sauna located in the hotel, and private workout sessions can even be arranged in you room. The pool area is impressively located on the 14th floor where you can enjoy spectacular views of the central valley and surrounding mountains. A 24-hour business center with everything you might need for conferences, meetings, and events. Central location with impressive views of the Central Valley. Pool with a view—this one of a kind swimming spot is on the 14th floor! A modern gym and sauna and the option to arrange for private workouts in your room. Close to Sabana Park which offers great options for those wanting a morning run outdoors. Restaurants and coffee shops nearby.